This is plate 8 from James Baillie Fraser's 'Views of Calcutta and its Environs'. 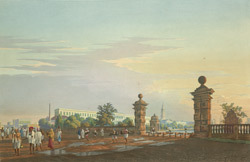 Fraser (1783-1856) arrived in Calcutta in 1814 and in six years time produced these animated sketches of the busy city. He incorporated into his collection five views of Tank Square. This image shows the Great Tank, which was an important reservoir supplying much of the city. Fraser wrote: "Inside the gate, a ramp, crowded with those who come to draw water, slopes down to the water's edge...the Bengali inhabitants of the city add interest, with a group of bhistis or water carriers with their goat-skins for carrying the water slung over their shoulders." Turnstiles in the gateway stopped animals from entering. The box at the entrance was the station of the watchmen, or chowdikars, who prevented people from bathing in the Tank.